A moment near the end of 1987’s The Stepfather crystallizes the elusive fantasy that motivates Jerry Blake, the damnably old-fashioned serial killer of the title. 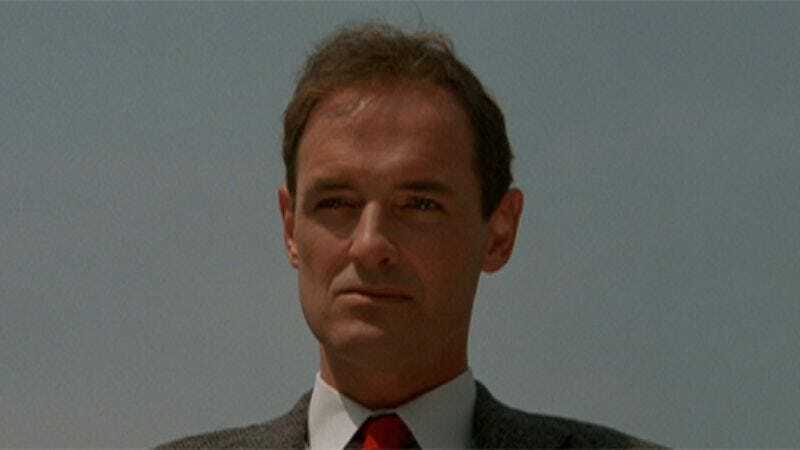 Played with deranged wholesomeness by Terry O’Quinn, a great character actor who most will recognize as Locke on Lost, Jerry moves from one tree-lined, family-friendly town to another, searching for single mothers in need of a decent, hard-working husband to stabilize the house. As one family situation falls apart, Jerry creates a new identity (along with a convincing disguise) and begins setting up shop elsewhere, then slaughters the women and children who have so bitterly disappointed him. After spending much of The Stepfather trying and failing to work his way into the heart of recently widowed Susan (Shelley Hack) and her teenage daughter Stephanie (Jill Schoelen), Jerry has reached that ugly transitional phase once more. Strolling along yet another tree-lined street in the flush of autumn, he spots a scene right out of a commercial, perhaps for life insurance or real estate, his trades of choice: a father pulling into the driveway, his daughter bounding out the front door (“Daddy!”) with smiling mother in tow, all in slow motion. Suddenly, Jerry’s face softens from anger into a kind of wistfulness. This is his dream, to be Ward Cleaver of ’50s lore, a type which existed on television but isn’t possible in the real world. He doesn’t know how that family of three lives behind closed doors, and the complications that animate (and probably enrich) their household; all he sees is the commercial, and he eternally strives to be its star. There are stock elements aplenty to The Stepfather—cheesy synth-based ’80s music cues, a disappointing slasher-movie climax, an entire subplot that knocks off Scatman Crothers’ doomed journey in The Shining—but the Jerry Blake character stands out for his brittle idealism. In those moments when Jerry gets to play the role of upstanding father and community leader—whether he’s erecting a birdhouse carved in his basement workshop/freak-out space, or delivering a soaring oratory on family at a neighborhood cookout—we can see his twisted psyche salved for an instant. And if it were possible to build a life on Saturday Evening Post covers, maybe he could transcend his clearly traumatic childhood, which the film wisely hints at but never fully reveals. But what he can’t accept is that part of being a parent that involves inviting a measure of chaos into your life, and his narrow, rigid thinking on being a father and husband drives him quickly to madness. The pulpy opening scene finds Jerry cleaning up after his latest bloodbath: trimming his shaggy beard and curly hair (strange that his wife would allow him to look like a hobo), trading thick glasses for contacts, and neatly discarding his clothes and hairpiece into a bag for disposal. As he descends the stairs from the upstairs bathroom, he passes a tableau of unbelievable carnage: three bodies gutted, blood all over the walls, every indication of a horrific crime of passion. In one sequence, writer Donald Westlake and director Joseph Ruben reveal the fascinating contradictions of Jerry’s character: He’s both fastidious and completely out of control. Some switch in his head allows him to shift from a rampaging maniac to a clinical thinker with an instinct toward self-preservation. O’Quinn’s face registers these changes transparently; he’s scary when his eyes go dark with rage, but scarier still when life disappears from them altogether. Here’s my theory about The Stepfather: It’s basically The Night Of The Hunter, except instead of religion, Jerry preaches the gospel of Reaganism. The parallels between the two films are many, and there’s no doubt in my mind that Westlake, an esteemed name in crime fiction, and Ruben, who came to specialize in genre thrillers, were keenly aware of them. Like Robert Mitchum’s sinister preacher in the earlier film, Jerry insinuates himself into a widow’s life with the promise of a clear, moral vision for the future. The widows in both films are too vulnerable and needy to question his motivations, but their children see right through their new stepfathers, yet have no credibility. The two stepfathers even have their own eerie themes: Mitchum’s deep, insinuating presence is announced with the hymn “Leaning On The Everlasting Arms,” while Jerry cheerily whistles “Camptown Races” as if it expels the cobwebs from his mind. Nevertheless, the sins of a tough decade in American cinema shouldn’t be held against the film so much that it obliterates what O’Quinn and the filmmakers bring to this character. O’Quinn isn’t supported by the masterful atmosphere and suspense that elevated Mitchum in The Night Of The Hunter, or Joseph Cotten in Shadow Of A Doubt, but there are few more memorable performances from the ’80s, and even fewer that comment so unmistakably on that era. Take away that pesky little habit of brutally slaughtering everyone who inevitably disappoints him, and his character could be Dan Quayle.